Spring is quickly approaching and many of you are dreaming about a new deck or porch. Decks can be a fun DIY project if you take your time and understand the basics. The basics start with a good foundation so this article will show you several alternatives to porch and deck footings. Anyone that has used one of these post hole diggers for digging holes for porch, deck or pier footings can tell you that it’s a miserable experience. Not only is it usually impossible to dig the hole unless you’re digging in beach sand but it gets very hard to get down to 4 ft below grade in a small hole because you can’t open the handles wide enough. So I thought it would be good to quickly review a couple options when it comes to building porch and deck footings for your next new deck or front porch addition. The following are two options we often use when building a new porch or deck. Over the years people would dig a hole with the post hole digger then insert a cardboard “sono tube” like the one pictured to the right. Typically the base would not be installed. The problem would be if you left the sono tube out in the weather and it rained the hole would sink in and you’d have to start all over. The other problem is the only way to use the base (which is typically required to reduce bearing pressure on the soil) is to dig a very large hole. Sono tubes are very popular because they are relatively inexpensive and require little in the way of specialized tools or equipment. Today we’ve got a much better solution! If you already need to dig a large hole to accommodate the large base, then you’re probably already using a large piece of earthwork equipment. If you’re doing that then I say the better solution is to use a precast concrete footing (see the picture below). The precast concrete footings come with a 27″x27″ square base and an overall height of either 48″ or 54″. The beauty here is twofold, one you don’t have to worry about the weather, and two you don’t need a concrete guy! Basically you dig down to the footing depth, level, compact and set the footing. Next all you do is backfill around it and compact it properly. We use these on all our new homes. They actually are cheaper and much more reliable than the old standby “sono tubes”. I used them for my front farmers porch and my large rear deck of my new home. I haven’t had any settlement problems or other issues. They also come with a threaded insert in the top of the footing that you can put a 1/2″ threaded rod into to use as a shear pin. 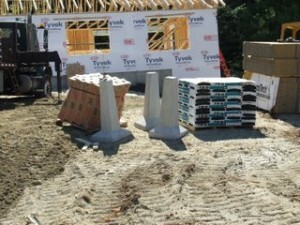 So next time you’re putting in footings for a porch, deck or other structure consider using precast concrete footings. Try calling you local precast concrete supplier to see if they carry them. I’m sure you’ll be happy with the results. Also check out this book about Building Decks. Before you build that new deck or porch this summer be sure to check with your local building officials. Decks and porches must conform to local building codes along with zoning requirements for setbacks from property lines. Each year I hear stories of people building a beautiful new deck or porch and later tearing them down because they haven’t followed the code or zoning. Good luck and enjoy! I haven’t seen these pre-cast footings locally but I’ll look for them now. When there aren’t large loads to bear, a favorite technique in these parts is to drill the post hole, pour in a bag of concrete mix (dry) and set the PT post on that. The theory is that the mix will take up soil moisture and cure, leaving a concrete footing under the post. In putting the concrete into the hole you are supposed to spra water in the hole before you pour in the concrete, when you make it moist it cures better and swells slightly to fill the hole better. Well I’m here to tell you that extra water does not make concrete any better. In fact, by adding additional water you’re raising the water/cement ratio therefore ensuring a lower strength concrete. Adding water to the hole is and old wives tale! Where can I find these precast concrete footings? I am interested to see if our building inspector has seen this before as I am building deck and a few foots need to 14 inch sonotubes or smaller with the bigfoot boot. I would love to use this precast system. Please let me know where you purchased yours. @ Robin – I bought mine in Newport NH at L.E. Weed & Sons. They are available at quite a few places around here now. Todd, I am building a deck in Virginia and would love to use these precast foortings, do you know who makes them or if they have a distributor in this area. @ Roberto – We just buy them from a local precast concrete supplier. They build them at their facility that also builds septic tanks, catch basins, etc. I recommend you call your local precast concrete suppliers. How much do these things (pre-cast footings) weigh? How difficult is it to lift them and place them into the hole? I’m in a rehab situation where we need to put the footing underneath an existing porch. There is a 2nd story of the house that overhangs the porch area that needs additional support (from a column that will rest on this proposed footing and run up through a hole in the porch floorboards). Massachusetts requires 48″ below grade for footing depth, so we need to dig a 4 foot hole under there (the under side of the porch is a good 4 1/2 feet above ground), then wrestle the footing in there, place it into the hole, and back fill it, all by hand (backhoe would not fit under there). We also may encounter ledge (solid rock) before getting down to the 48″ depth, so we have to dig first, and take measurements, before deciding what to use for a footing. The ledge may be uneven, so we’ll have to come up with a plan to accommodate that. If we go with a sonotube, we might be able to run the chute from a concrete delivery truck in to fill it. Otherwise, we’ll have to wheelbarrow it in. @ Glenn – They are extremely heavy and require equipment to lift them. I supposed you could get them close with a dolly then use some sort of jib crane or come-along to move them. You could possibly try renting a engine hoist from a rental company. Greg check out EZ Tube at e-zcrete.com. Its a modular footing that stacks together like legos and has a anchor rod that goes thru the entire system. I’m wondering your thoughts on helical screw piles. If you have any experience with them, how do they compare to pre-cast piers? Thank you for any insight. We’ve used them before. Typically they are a bit more expensive. But in tough to access locations they can be a better option.